Introducing the world's first water powered (and battery free) shower timer. With it's clean design the timer can be retro-fitted directly on the mixer outlet of your shower. By turning on the shower the water flow powers an integrated turbine which creates energy for both the internal electronic timer and coloured LED lights. This great little device will remind you of your showering time and in return help save energy, water and money. - Can be installed by anyone in under a minute. The H2OTM Shower Indicator is a patented innovative product which uses the latest technology of miniature water turbines to create energy for the electronics. Buying this product will earn 180 Loyalty Points. 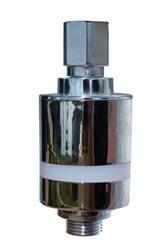 Be the first to submit a review for the H2O (Water Powered) Inline Shower Timer Indicator.